Canada has foolishly, irresponsibly signed the UN Global Compact for Safe, Orderly and Regular Migration (which James Delingpole calls “the UN’s sinister blueprint for migration hell”). However, the draconian “migration hell” agreement has not been debated or voted on in Canada’s Parliament, PM Justin Trudeau and his Liberal government did not inform Canadians, Canada’s taxpayer-funded state broadcaster the CBC has not enlightened its audience, and most of the mainstream media have remained deaf, dumb, and blind about it. The UN Global Compact references “sustainable development” 22 times, and the 2030 Agenda for Sustainable Development, 13 times. The UN Global Compact’s plans for nightmarish unfettered, aggressive, free-for-all migration are paired with mandates to meet the UN’s dictatorial “sustainable development” goals. “Sustainable development” is nothing more than a brazen power grab, the UN’s excuse for a bid for supranational unelected, unaccountable global governance, coerced wealth redistribution, deindustrialization, and the abrogation of national sovereignty, individual freedoms, and democratic rights. The UN 2030 Agenda for Sustainable Development grew out of the 1992 UN Agenda 21 “programme of action” for sustainable development. The UN created an imaginary planetary climate emergency, supposedly caused by plant food carbon dioxide driving fictitious manmade climate change, which can only be “fought” by UN fiat, diktat, and command-and-control over everyone and everything. The UN decrees that “Sustainable Development” must be at the core of and govern every single human endeavour, including migration. The UN Global Compact for “safe and orderly” (come one, come all) migration is yet another pernicious, insidious UN scheme to advance and enforce its destructive, sovereignty-robbing policies, regulations, laws, and diktats meant to hobble states and tighten the noose of “sustainable development” around the necks of industry, resources, and people. At the same time the UN Global Compact gives “migrants” the unprecedented “right” to migrate, and foists them on states without the vote or agreement of their citizens. It gives migrants more special rights and freebies than any hardworking or homeless Canadians have ever received. Migrants to Canada will become persons with special status beyond the reach of mere mortal Canadians, who are left to foot the hefty migration bill. YouTube commentator AmazingPolly brilliantly puts the special status given to migrants into shocking perspective. She posits that under the UN Global Compact, 225 million migrants will become de facto UN citizens that the UN will use, without doing any of the heavy lifting, to colonize signatory states. As she puts it, migrants become walking, “portable UN jurisdictions.” Wherever they go, they will have the protection and “rights” given to them by UN fiat, and the host signatory country is saddled with providing and paying for them. Every migrant will in effect be planting a UN flag in the nation of his or her choice, says AmazingPolly. Pundits and politicians have been telling us that what’s in the Global Compact is nothing to worry about, because it’s “non-binding.” Andrew Lawton exposes the lie. 3 (3) This Act is to be construed and applied in a manner that (f) complies with international rights instruments to which Canada is signatory. The Global Compact would appear to be an “international rights instrument” and Canada has signed it and the Act must comply with it. Canada, for one, is currently being governed as if UN agreements such as UN Agenda 21, the UN 2030 Agenda, the UN Paris Agreement, et alia, all of them supposedly “non-binding” agreements, are legally binding. In the case of the so-called “non-binding” Paris climate agreement, the Trudeau government in Canada has been acting on and implementing the “commitments” (for example blocking fossil fuel industry operations and needed pipelines) and developing laws (“carbon” taxation) in order to fulfil the UN diktats contained in it. Trudeau, an apparent globalist (“There is no core identity, no mainstream in Canada … the first postnational state“) and admirer of “basic dictatorship,” has stated that Canada should take the lead in implementing the UN Global Compact. In fact, he has already been acting in accordance with it, judging by his open Twitter invitation to all comers and the huge number of immigrants/migrants, supposed asylum-seekers heeding the call and streaming illegally across the border from the USA into Canada. While supposedly “in full respect for the freedom of the media,” signatories are directed to mete out punishment by withholding public funding if the media haven’t been properly sensitized and educated, and therefore are guilty of committing migration wrong-think. So read, share, and discuss while you still can without risking jail! 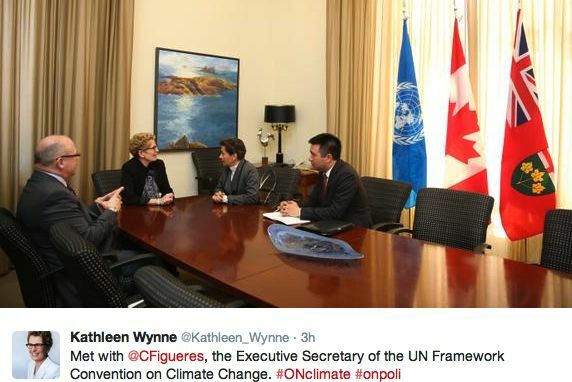 If ever you wanted additional proof that Ontario’s Premier Kathleen Wynne is a faithful, loyal follower of the U.N.’s bid for global governance, enforced wealth redistribution, de-industrialization, and de-population (all of it aka Agenda 21) by means of a deliberately-fabricated planetary climate emergency, look no further than her tweet today (see above). Why was Figueres, an unelected, unaccountable U.N. kommissar, invited to stick her nose into the domestic and sovereign affairs of Canada and Ontario? In her tweet, she proudly announces meeting with Christiana Figueres, the U.N.’s “climate change” queen, who presumably gave the premier a pat on the head (much like manmade-climate-change-huckster Al Gore did last November) for her latest catastrophic fake-eco move to impose a pernicious “carbon” cap-and-trade scheme on Ontario, which is supposed to somehow dial down the (nonexistent) manmade climate change that is not happening despite the alarmists’ best efforts to have us see what plainly isn’t there. The tweet contains no less than three photos of Wynne posing with the U.N. apparatchik. So there they are, Wynne and Figueres, sitting at the table for their photo op, all smiley-smiley, with Wynne presumably re-pledging fealty to the U.N. climate orthodoxy. The flags of Canada, Ontario, and the U.N. stand guard in a neat row behind them to lend an air of credible dominion to the whole thing. There’s a direct line of dots connecting the deliberate lies of the U.N.’s Christiana Figueres about “emissions” causing global warming, to the disastrous Wynne-McGuinty phoney-green policies, to the suffering of the people in rural Ontario, victims of the economically useless, environmentally destructive industrial wind turbines, and ending in the economic decline of Ontario and the exploitative taxation and impoverishment of the people. The real play is not about a better, cleaner environment, but rather about a concerted bid for global governance and control, and in the process destroying democracy, sovereignty, industry, progress, and personal freedom of choice. 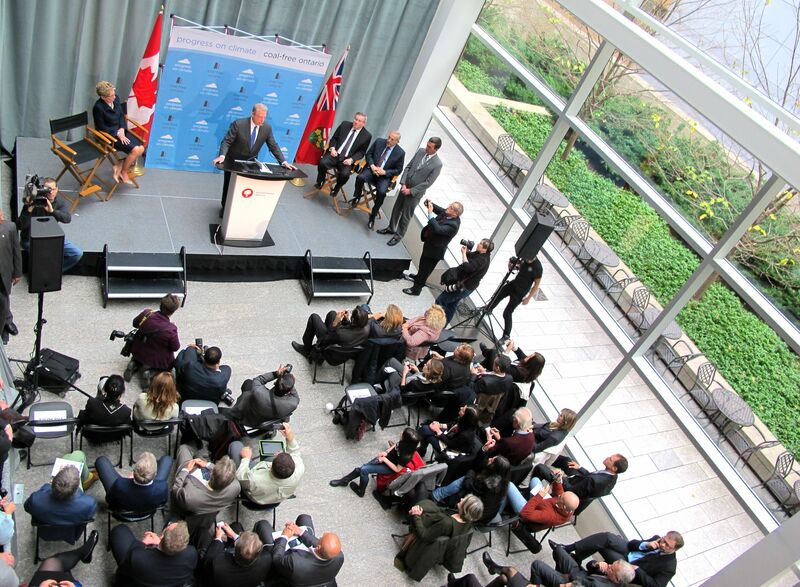 On Thursday, November 21, 2013, it was on full public display – Ontario’s Team Agenda 21 (carbon trader Al Gore, Premier Kathleen Wynne, Environmental Defence Executive Director Tim Gray, Minister of the Environment Jim Bradley, Minster of Energy Bob Chiarelli), assembled in Toronto to congratulate itself and celebrate the closing of the last coal plant in Ontario, and to announce a new step further into the disastrous black hole that is the province’s energy program (outlaw the burning of coal altogether), and to be anointed and blessed by the high priest of man-made climate doom-and-gloom, Al Gore, who pronounced, “You’re doing a fantastic job”. This was clearly not an Ontario government event. 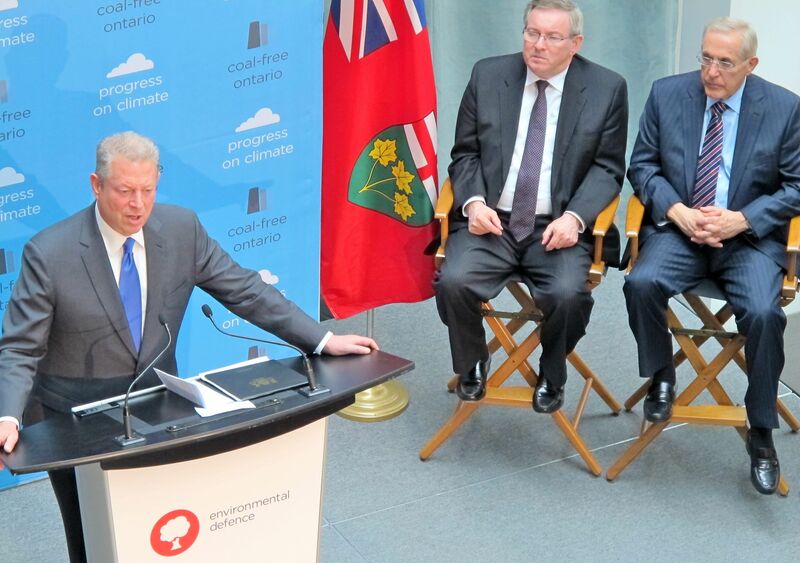 There was no Province of Ontario logo – neither on the podium, nor on the backdrop. The event was apparently conceived, organized and hosted by the unelected, unaccountable “green” activist NGO, Environmental Defence, an organization apparently funded in large part by foreign money. 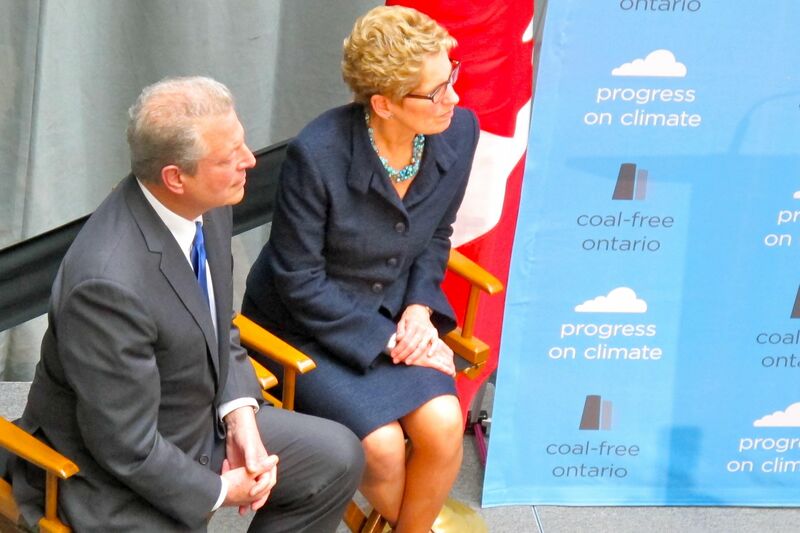 Only Tim Gray, Kathleen Wynne and Al Gore spoke. The Ministers of Energy and the Environment each provided mute support throughout the event, as props perched stiffly on high chairs on the stage. As Parker Gallant has asked, who is really setting Ontario’s ruinous energy policies? Thank you very much, Tim, and thank you so much for your introduction, for the work you that you do. As you were just discussing: your job is to push us, right? So I appreciate that…I want to thank Tim and everyone at Environmental Defence for putting together this fantastic event. And I’m very pleased to be joined by our Minister of Energy, Bob Chiarelli, and our Minister of the Environment, Jim Bradley…Bob has shown tremendous leadership on energy issues in Ontario, and I’m very proud to have him in that role and Tim has been a passionate advocate for environmental issues since the 1980s and is helping to drive our issues in that portfolio…and Tim, it’s wonderful to have you here in that role…and it’s a huge honour to be here with you, Mr. Vice-President, thank you very much for being here. If climate change is left unchecked it will lead to rising sea levels, more sweltering heat waves, more disappearing glaciers, and extreme weather events that could have potentially devastating consequences on our health, on our environment, our economy, and our lives. And, of course, there are aid agencies and global leaders saying that climate change has already contributed to humanitarian disasters like typhoon Haiyan in the Philippines. And I would contend it’s our moral duty to take action to protect our children, our grandchildren, and our fellow citizens. We’re lucky today to be in the presence of a man who’s been fighting on these fronts for many years. Years from now, depending upon the circumstances that we allow to unfold, the next generation will ask one of two questions. If they see the continuation of super storms, and deadly droughts, and tropical diseases ravaging temperate zones, and sea level rise, and the collapse of governance in places where the storms are too powerful and too frequent for people to recover and adapt to survive – if they do not have hope, if they look at their children and feel a sense of despair, they would be well-justified in asking of us, what were you thinking? Why did you not act? – and a venal, corrupt, profiteering, mendacious, self-righteous, manipulative celebrity to put his creepy brand of approval on the whole catastrophe.